Elyse is originally from the Cleveland, Ohio, area. 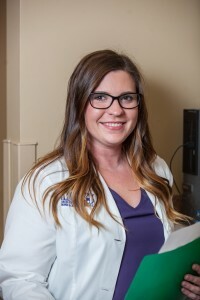 She was recruited by North Carolina State University for her gymnastics ability, and she stayed in state to attend East Carolina University for her Physician Assistant studies. Since moving from Ohio, Elyse said she realized that she loved being in the south and just never left! Prior to moving to Middle Tennessee, Elyse worked at an orthopedic practice in Boone, North Carolina. She had visited Nashville before to see family and really liked the area. When she was looking for jobs, she always kept an eye open for positions in the Nashville area and was excited to see an opening at our clinic. Professionally, Elyse is proud of graduating from her Physician Assistant program and passing her boards. While she lived in North Carolina, she was able to form great relationships with patients in her care. Ensuring her patients are well taken care of and finding ways to make a difference in their lives is one of her greatest accomplishments. She feels that education is very important so patients will understand and feel comfortable with their diagnosis and treatment. Part of her responsibility is to spend a little more time with the patient to answer any questions and offer comfort. Elyse’s ultimate goal is to provide a better patient experience. Personally, Elyse is proud of her performance in gymnastics as a child all the way to college. She spent 16 years in the sport, specializing in uneven bars. While participating as a Division I college gymnast, Elyse was part of the conference championship winning team and was named an NCAA Academic All-American. As a student athlete participating in a sport at the collegiate level, Elyse experienced her fair share of injuries and surgeries during that time which lead her to focus on orthopedics. Those injuries have given Elyse a different perspective when interacting with patients. She says it allows her to say she has been there and gives her a unique understanding of what the patient is going through after experiencing an injury or surgery. Elyse also has a passion for sports medicine. Her previous employer was the official sports provider for Appalachian State University athletics, giving Elyse experience in covering sporting events and being available to training staff on the sidelines.